The whole Middle East now sees a complex series of struggles centred around Aleppo, Raqqa, Mosul and Yemen in which US imperialism is desperately seeking to manoeuvre around various client states and proxy jihadist forces to achieve its strategic aims. Other areas of conflict like Ukraine reflect these aims also. These aims are regime change and state breakup in Syria and Iran and the defeat of the rebel forces in the Donbass. They have already achieved these aims Afghanistan, Libya and Iraq. The aim is to move on to regime change and breakup in Russia and China. The various client states and proxy agents of imperialism in the region are also manoeuvring amongst themselves to be the central agents of US imperialism in its own area and in the overall region. We reject absolutely the position that there are two rival imperialism powers, ‘Western imperialism’, the USA and its clients and ‘Eastern Imperialism’, China and Russia, fighting out their economic and political interests in the region. Russia and China are not imperialist powers but are also struggling to establish themselves as more favourable clients of US imperialism in the Middle East and globally. There is one global hegemonic power, the USA and other imperialist powers remain subordinate to that, willingly as with Britain or unwillingly like European states and others, Germany and France in particular. As with Stalinism in the USSR and China in the past and current Stalinist forces these bourgeois nationalist regimes and militias have absolutely no perspective of calling on or assisting the working class in these great metropolitan centres to defeat imperialism in the sense of overthrowing it in its own imperialist heartlands, the USA, Europe, Japan etc. Only Lenin and the Bolsheviks had such a perspective in the past in the great Russian Revolution. Only revolutionary Trotskyism maintains and fights for that perspective today. There is no substitute for the struggle for that perspective or no force that will substitute for that ideological and political struggle. We will examine each conflict in the region and Ukraine to show how it conforms to that perspective, firstly with the struggle in Aleppo. Jihadist forces in Eastern Aleppo have suffered their biggest defeat since 2012. Assad’s Syrian Arab Army (SAA) and its Iranian allies in a pincers movement with the Kurdish PYD/YPG have cut the rebel held territory in two, taking some 75% of it as of 6-12-16 following sustained bombardment by the Russian and Syrian air forces. On Saturday 26th they took the Hanano neighbourhood and on Monday the Sakhour district fell to the joint assault of the SAA and the PYD/YPG. In an expression of the new alliance between the SAA and the PYD/YPG they have jointly waved flags over building in Bustan al-Pasha and they jointly control some places in Bustan al-Basha, al-Halek and Ayn al-Tell. The mass media, all imperialist politicians and the pro-imperialist left have wept tears of blood over the terrible suffering of the civilians in East Aleppo. France and Britain are demanded a meeting of the United Nations Security Council. French Foreign Minister Jean-Marc Ayrault said Syrian government forces and their allies would not resolve the Syrian conflict by carrying out one of the “biggest massacres on a civilian population since World War Two”, Reuters reporters on 29 November. Ayrault was speaking in Minsk, the Belarusian capital before a meeting of Russian, German and Ukrainian delegates to discuss the Ukrainian crisis, the other major conflict that pits Russia against the West. Significantly neither Britain nor the US were invited to this meeting, displaying both the growing attempts of Franco/German imperialism to forge their own international relations independently of Anglo/America imperialism and their continuing alliance with and dependence on the money and firepower, real or potential, of the USA in exploiting the semi-colonial world. The tears of these ruling class representatives for the humanitarian crisis unfolding in Aleppo are, of course, tears for the impeding defeat of the pro-imperialist defenders of East Aleppo. Here, we must believe, Assad and the Russians are deliberately targeting civilians, schools, and hospitals whereas in the contemporaneous siege of Mosul those defenders are using the civilian population as human shields and any civilian casualties are completely accidental ‘collateral damage’ and the fault of the defenders. Most of the public at large will fail to spot this gross hypocrisy however it is inexcusable of the politically educated pro-imperialist left to pretend not to notice it and to repeat it themselves. Who are the defenders of East Aleppo? According to Amnesty International there are five main jihadist groups defending Aleppo and Idleb since 2012; the al-Shamia Front, the Nour al-Din al-Zenki Movement and Division 16 in Aleppo, all of which joined the Aleppo Conquest coalition of armed groups in 2015, Jabhat Fateh al-Sham (formerly Jabhat al-Nusra) and the Ahrar al-Sham Islamic Movement in Idleb, both of which joined the Army of Conquest coalition of armed groups that same year. Note the formation of a joint command of the Aleppo Conquest coalition and to see off any suggestion that these groups are ‘moderates’ in any form. They are funded by the USA or its clients in the region, severally by Saudi Arabia, Turkey, Qatar, Jordan and Pakistan depending on which particular brand of fundamentalism they embrace. They all seek an Islamic state and Sharia law and, to one degree or another, death for apostates; Shia Muslims, Christians and Sunni Muslims who support Assad. Children included. “A video circulating on social media appears to show Syrian rebels beheading a Palestinian boy who they accused of being a pro-government fighter. The video, posted online on Tuesday, shows a group of men in the back of a truck cutting off the head of the terrified boy. Before the gruesome murder, the men accuse the boy of being a member of the Liwa al-Quds (Jerusalem brigade), a Palestinian armed group fighting alongside Syrian President Bashar al-Assad’s government. The Jerusalem brigade posted a statement on its official Facebook page on Wednesday, identifying the boy as 12-year-old Abdullah Issa, who they said was not a fighter. “By taking one glance at the child – the argument that he was a fighter is immediately disapproved,” the group said. The rebels have been identified as members of the Nour al-Din al-Zinki Movement. On Tuesday, the movement published a press release on its Twitter page condemning the killing of the boy and calling the beheading an “individual error that does not represent the general policy of the movement”. The United States, which has previously provided military support to the Nour al-Din al-Zinki Movement, said it was “seeking more information” and that it could not confirm the “appalling report” at a press briefing on Tuesday. “If we can prove that this was indeed what happened and this group was involved in it, I think it would certainly give us pause,” State Department Spokesman Mark Toner told reporters, after being asked whether this incident would affect US assistance to this specific group. Apologists for these monsters point out he was 12 and not 10 as originally claimed and that he was really a 19-year-old fighter with a growth deficiency disease. You may judge from the photograph. The Syrian Observatory for Human Rights is a pro-imperialist anti-Assad group based in the UK who must relate some of the truth to retain any credibility. No doubt Nour al-Din al-Zinki will suffer no loss of funding; the CIA have only to ask the Saudis to take it over to preserve some level of deniability in their campaign for “democracy and justice” in Syria. An Amnesty International report released on 5 July 2016 detailed further barbarisms by the Jihadists. Whilst asserting that: “Government forces have been responsible for the majority of violations, including war crimes and crimes against humanity, subjecting tens of thousands to arbitrary detention, torture and other ill-treatment and enforced disappearance”. which they spend almost all they efforts exposing, they are forced to admit that: “Armed groups opposing the Syrian government have committed serious violations of international humanitarian law, including abductions, torture and summary killings”. There in embryo is the sate that would rule the whole of Syria if this foul ‘revolution’ succeeds. It is worth noting that shabiha fighters are pro-Assad militias who are mostly Alawite in southern Syria but in Aleppo and Idleb are “composed entirely from the local pro-Assad Sunni tribes such as al-Berri, al-Baggara, al-Hasasne and al-Zeido. In the city of Aleppo itself it was led by a powerful Sunni Arab al-Berri tribe”, according to Wikipedia. This should be sufficient to demonstrate that the Syrian civil war is not Shia vs. Sunni but an attempt by the USA to impose a far more pliant pro-imperialist regime in Syria. Now the noose tightens around Mosul and the forces involved there are even more complex but we insist these conflicting wars within wars are primarily for the allegiance of the USA; to become its primary local agents. We are for an anti-imperialist united front with those who are fighting to retain at least a measure of national sovereignty and self-determination against the drive of US-dominated global imperialism to install puppet regimes and state break up in the region. As we give unconditional but critical support to Assad and his Russian backers in Aleppo and are for the defeat of ISIS and the jihadist forces sponsored by US imperialist and their Turkish and Gulf allies as the only way to defend what remains of the national sovereignty in Syria so the same principle applies to Mosul, Raqqa, Yemen and the Ukraine. So, unconditional but critical support to the Sunni defenders of Mosul and those who are struggling right now for some measure of Iraqi sovereignty and are ready to get rid of their ISIS oppressors too. The reforming of a secular Iraqi Sunni/Shia state is against the aims of US-dominated global imperialism in the region. Those aims now are the carving out of a client state across the 1916 British/French/Tsarist Sykes-Picot border of Syria and Iraq. The Bolshevik revealed the treacherous secret agreement in November 1917 and the historian Peter Mansfield observed of that “the British were embarrassed, the Arabs dismayed and the Turks delighted”. There is much emphasis on the ‘historic wrong’ of that agreement now in order to prepare for the creation of a new puppet state crossing the Syria/Iraq border. Our line in the region is to oppose this by all means and to support those forces who are or may begin to oppose it however temporarily or inadequately. And that means the Iraqi army and its Iranian allies in any future military conflict between them and the Turkish/Peshmerga forces. 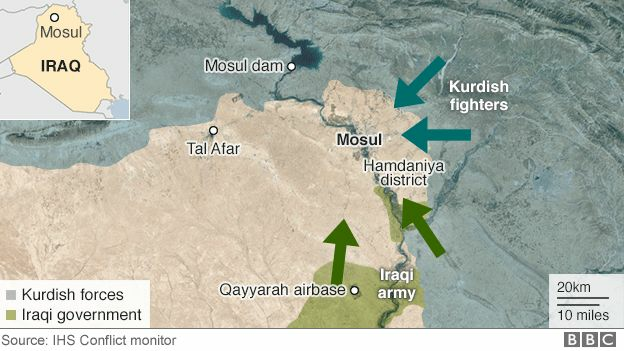 At present the US is supporting all sides besieging Mosul apart from Turkey. But Turkey is allied to the 150,000 strong Peshmerga forces with particularly strong ties to Barzani’s section. Remember the no-fly Kurdish zone imposed by the US after the 1991 Gulf War consolidated pro-imperialist Kurdish governments in the region. Turkey has massed tanks on the Iraqi border, threatening full scale invasion if the Shia militias begin ethnic cleansing the Sunni Turkmen town of Afar, part of the old Ottoman empire, whose fall is now imminent. And Turkey’s invasion would gell well with the US aim of a Sunni Muslim puppet state around Mosul and Raqqa. And that too is Erdoğan’s project in invading Syria, as he let slip in anger over the killing of his soldiers by Syria’s air force east of al-Bab. For now, Iraq and Iran are calling the shots with US support but, as ever, the US has no permanent allies, only permanent interests, so that may change after the defeat of ISIS. The forces involved in the siege of Mosul are the Iraqi Army and its allied pro-Iranian Shia militias, the Popular Mobilization Units, (PMU) or ‘Hashd al-Sha’abi’, Iran’s IRGC are assisting Prime Minister Haider al Abadi’s Iraqi army and militias. The Kurdish Peshmerga forces of Iraqi Kurdistan are divided internally between those militias loyal to Masoud Barzani’s Kurdistan Democratic Party and those loyal to Jalal Talabani’s Patriotic Union of Kurdistan (PUK). They maintain separate commands though both are nominally loyal to the President of the Kurdistan Regional Government (KRG), which is Barzani. But tensions are never far below the surface. The Turkish Workers Party (PKK) is located in the south west of Iraqi Kurdistan in the Sinjar mountains. The PKK is politically close to Talabani’s Peshmerga militias, having fought on the same side during the Kurdish civil war from 1994 to 1998. Turkey backed Barzani in that civil war and now has troops located in the territory held by Barzani’s forces. Iran backed Barzani until 1995 and then switched sides to Talabani. The USA backed Talabani from 1996. Turkey has bombed PKK camps several times since the end of the ceasefire with Öcalan in the middle of 2015. The Iraqis complain that Turkey has invaded their country but Turkey refuses to leave because they say that Mosul is a Sunni Muslim city and they want to ensure it is not ethnically cleansed by the Shia militias who did that in Ramadi in February 2016 and Fallujah in June 2016. They could not host another million Sunni refugees fleeing Mosul from the Shia militias. Of course, Turkey is also there to attack the PKK who might expect assistance from Talabani’s Peshmerga forces who might split in that instance. There has been rumours that the PKK has extended feelers to the Iraqi army for an alliance with them against Turkey. After the civil war ended in 1998 the USA armed both Peshmerga militias and after the fall of Saddam in 2003 Barzani became president of Iraqi KRG and Talabani President of Iraq. So the fall of Mosul may well lead to another battle for control of the city between Iraq and Turkey with Iran siding with Iraq and the Peshmerga forces splitting between the two. Turkey has a historic claim to the city as part of the Ottoman empire stolen from them by Iraq with the assistance of the British. Complicating this further is the tensions between Iran and Saudi Arabia over the war in Yemen. Of course, Saudi Arabia, with the backing of the USA and Britain, wants to defeat the Shia Houthi rebels, who are supported by Iran and Hezbollah. The US wants to restore the Abdrabbuh Mansur al-Hadi regime, installed in 2012 by the Saudis after the uprising inspired by the Arab Spring in Tunisia and Egypt in 2011 ousted President Saleh. Saudi Arabia would inevitably be drawn into a post ISIS war on the side of Turkey and the US and Russia would be forced to back Iran and Iraq for a period but we must remember that the prime ally of the USA in this region is Turkey. This may well turn out to be a pipe dream by Ash Carter; Turkey is strongly opposed and spoke the truth in anger when he said he had come to overthrow Assad following the loss of his soldiers east of al-Bab, after the fall of east Aleppo became inevitable. And Erdoğan would surely fight any Iraqi troops attempting to take Raqqa. Assad, his Hezbollah and Iranians allies and the Russian air force may now get there first and that we would support. Another war within a war, or in reality the same one as in Mosul, is threatening here. In the conflict in Ukraine it is increasingly clear that Putin is prepared to sell out the Donbass in return for a compromise with US, and in particular, EU imperialism. Note above it was only French, German, Russian and Ukrainian delegates in the meeting in Minsk, there were no US or British delegates present. Weak and losing strategic space in the Middle East after the defeat of his mercenaries in Aleppo, imperialism now ruled by Trump. attempts to divide his enemies. Therefore, even before taking office, Trump, the representative of entrepreneurs, moves into conflict more with China that with Russia. The US and China have many more economic ties than the US and Russia. For this reason, Trump’s organically entrepreneurial government is concerned about making more profits in society by reducing China’s profits. In the Middle East, Israel will get carte blanche from Trump to take any offensive initiative as a show of force, starting by the conversion of Jerusalem as the capital of the State of Israel, by taking more Palestinian territory through the expansion of the Zionist colonies. The part of the White House, Trump must annul the agreements of Obama with Iran and support the war drive of Israel in relation to the Persian country. The Zionist fraction of imperialism tends to gain strength from the election of Trump. The struggle against Zionism and against imperialism is gaining new momentum throughout the Middle East. The Syrian, Palestinian, Iranian, and Russian nationalist bourgeoisies and their military united front are unable to carry out the task of defeating and driving out imperialism and its agents in the region. This is a task that only the proletariat can carry out, taking advantage of this momentary victory to increase its organization and its internationalism by building a revolutionary leadership, the strategy with which the Liaison Committee of the Fourth International is founded. The Guardian, 26-10-16, US and allies prepare to take Raqqa from Isis as battle for Mosul continues, https://www.theguardian.com/us-news/2016/oct/26/isis-islamic-state-us-raqqa-mosul-syria. ” imperialistic aims (such as securing its military base)”. That is not an imperialist aim. Were the actions taken by the USSR before WWII “imperialist aims”. No, as with the occupation of Finland Trotsky regarded them as legitimate, thus incurring the wrath of Shachtman and hos petty bourgeois followers. A workers state can’t have imperialist policies, which depend on capitalist exploitation; but this isn’t the case for nonimperialist capitalist countries. After all, one semicolonial country can nationally oppress another.